Got 160 bucks, a love of leather and a strange taste for dots? Maybe you should check out these hot new Pac-Man 30th anniversary wallets from Namco Bandai. That's right, it's been three full decades since the world's most famous dot-munching animated pie chart took its first step toward becoming a legitimate cultural sensation. And what better way for the teenage arcade dogs of 1980 who have become the middle-aged, disillusioned office drones of today to celebrate such a momentous anniversary than with a commemorative wallet straight from the company that brought us the game? 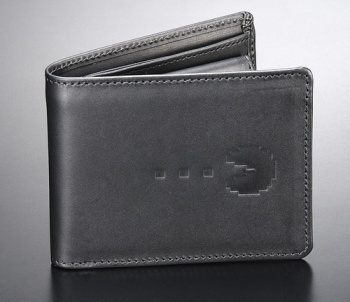 The official Pac-Man 30th Anniversary wallet is available in black, blue and red with an attractive Pac-Man motif lining, and comes embossed with the famous Man on one side, one of his ghostly adversaries on the other and a 30th anniversary logo on the inside. More practically, it also includes four slots for credit cards and a handy change purse. Of course, all this officialness doesn't come cheap: The Pac-Man wallet will cost Â¥14,800, which translates into about $158, but it's a safe bet that die-hard fans will have to fork over a lot more than that, since it's apparently only being released in Japan. 158 bucks so I can tell people my wallet is the one that says "wakka wakka wakka" on it? Cool, yes, but a bit too rich for my blood.